Joe R. Suchanek, far left, Ronald Pace and Mary Elizabeth Harris. NATCHITOCHES – Joe R. Suchanek of Fields was the winner of the 2017 Louisiana State Fiddle Championship held at Northwestern State University as part of the 38th Annual Natchitoches-NSU Folk Festival. Mary Elizabeth Harris of Breaux Bridge was second, followed by Ronald Pace of Alexandria in third. The Championship was held on in Magale Recital Hall on the Northwestern State University campus. Harris won the 21 and under championship division, and Suchanek took first in the 60 and up championship division, with Pace coming in second. Suchanek has played the fiddle for 40 years. “I broke my leg working cows. I was off my feet for six months, so I spent that time killing cats learning to play the fiddle,” said Suchanek, who also plays the guitar, mandolin and bass, plays in his church, and performs bluegrass and swing on other occasions. Third place winner Ron Pace has played the fiddle for 25 years. Pace wanted to play the fiddle as a child but was unable to acquire one, but found a fiddle as an adult in an unusual manner. While working as a school bus driver for Rapides Parish, one day as he made a stop to drop children off he noticed a fiddle in a nearby garbage can. He returned to the home after his shift and obtained permission from the lady of the house to take it. Finding the instrument reignited his desire to play the fiddle, so putting his guitar aside, he took up the fiddle instead. Pace enjoyed playing in the Championship and plans to return to compete again next year. 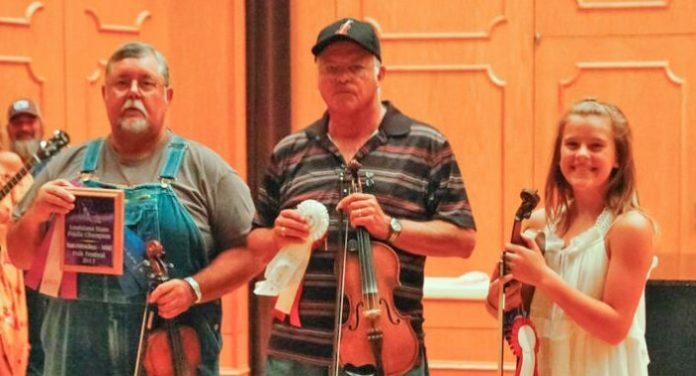 2017 Fiddle Championship judges included fiddlers Joanna Calhoun, Steve Harper, Andrej Kurti, and Leo “Buddy” Terzia. Calhoun was the 2016 Louisiana State Fiddle Champion. Next year’s Fiddle Championship will be held on July 21, 2018. Support for the Festival was provided by grants from the Cane River National Heritage Area, Inc., the Louisiana Division of the Arts Decentralized Arts Fund Program, the Natchitoches Historic District Development Commission, the National Endowment for the Arts, the Lower Mississippi Delta Initiative of the National Park Service, the New Orleans Jazz and Heritage Festival and Foundation, and the Shreveport Regional Arts Council. Much needed support also came from the City of Natchitoches, City Bank, Cleco and the Natchitoches Area Convention and Visitors Bureau.